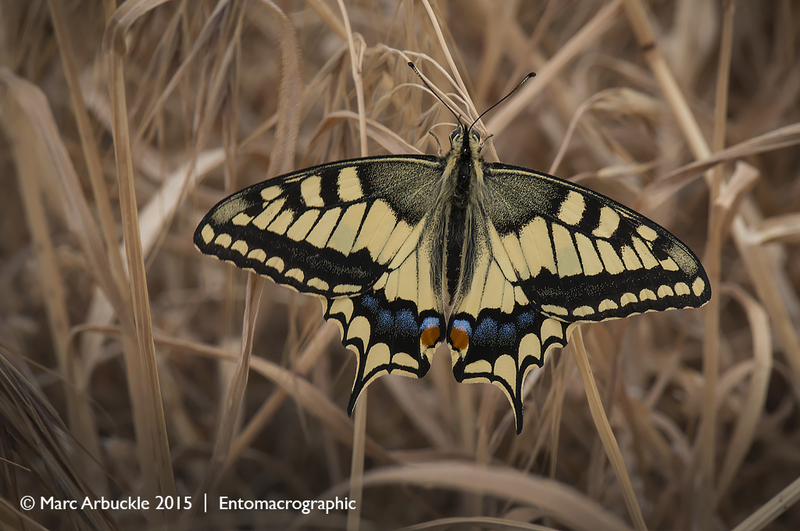 I’m back from Cyprus now but while I was there this was one of the butterflies I was keen to photograph, the European Swallowtail Papilio machaon. This is the subspecies syriacus. I was lucky enough to get this shot early one morning while walking along the cliffs of Kapparis. The colour of the grass in the background will give you some idea of how hot it was. We get them here in England and I’ve previously written about them in a post about one I photographed in Kefalonia here but our native subspecies britannicus remains a rarity and is confined to the fens of east Norfolk. However, in some years we do get a few migrants from the continent. This subspecies gorganus is less fussy and will use many kinds of Umbellifer, such as Wild Carrot daucus carota, as the larval food plant. In 2013 there were many sightings in Hampshire, Sussex and Kent including some evidence of egg-laying. In April 2014 a specimen was photographed near Winchester, Hampshire which suggests that some specimens may have successfully over-wintered. More info here. So the continental species may well become more common in future.